If there is a dentist in Mayberry his name would be Mark Olbina. Some people take issue with my calling our island community Mayberry-By-the-Sea. I mean it with heartfelt affection and appreciation for my island home. Every parade is treasured; every cheerful greeting and short trip to pick something up is celebrated. The people of Mayberry are ever friendly and, yes, competent and always there for each other. So Dr. Olbina would be in good company with the people of Mayberry - Andy, Opie and Aunt Bee and, of course, Barney Fife, Floyd Lawson, Gomer Pyle and Ernest T. Bass. The popular TV show shared a timeless and heartwarming portrayal of American small-town life during simpler times, where traditional values were cherished, and people respected and cared for one another. Sometimes a time warp is a good thing. If there were a Mayberry citizenship test, Dr. Olbina would win in a New York minute. Remember that a New York minute is quite a bit faster than a Mayberry minute. A Mayberry minute may take hours, as you would take the time to stop and chat a while before getting down to the business at hand. Why am I nominating Dr. Mark Olbina? He came to my rescue. Early one morning and half asleep, I let our two dogs out for their morning airing. Turning back to go into the dark house I miscalculated and collided with an unrelenting glass door. Drooling blood, I made my way to a mirror to assess the damage. I took inventory - cut lip and a wobbly front tooth. It wasn't pretty. On top of everything else we were leaving on a trip the same day. What to do? I dialed our dentist, Dr. O, who was just getting ready to leave to volunteer his time at a dental clinic in Yulee. When he heard my plight he said he'd meet me at his office in 10 minutes. No one likes trips to the dentist office, but I was not worried because I knew that Dr. Olbina prides himself in putting his patients at ease and making sure they feel no pain. Visits for my regular cleanings are always painless and the friendly atmosphere of the office is comforting. Following instructions, I opened wide and the news was not good. The loose tooth was broken, but it could be temporarily glued and I could continue on the planned trip. "You can smile, but don't chew," Dr. Olbina instructed me as he sent me on my way. How blessed we are to live in community where a caring professional makes time to help a lady in distress. I have always known that Mark Olbina is a nice guy, and now I have the facts to prove it. I have inherited my parents' less than perfect teeth, and spent my youth enduring repeated visits to the family dentist. By my high school years, I had learned to associate pain and fear with those all-too-frequent trips. I added monetary pain to the list when I began to earn my own money. I remember that I had a running account, not with the local dress shop, but with that dentist. I'd give him a chunk of my paycheck every month, whether I owed anything or not; his bookkeeper maintained a line of credit for me. We all knew I'd need to use it sooner or later. My dad jokingly accused me of joining the Navy solely because of its free dental care. As you've probably figured out by now, I had a full-blown case of dentophobia by the time I met Mark. He was a lieutenant in the Dental Department at Kings Bay Naval Submarine Base in St Marys, Ga., when I reported there for duty in early 1985. He and his boss spent the next couple of years curing me of my panic attacks, and I will be forever grateful to both of them. I have since met several other people who also credit Dr Olbina with curing their own phobias because of his gentle and professional care. Mark opened his practice on 14th Street a couple of years before I retired, and I thought that the name he chose for it - Amelia Gentle Dentistry - was accurate, as well as appropriate. That newborn practice sported two operatories, with room for two more. By the time he was ready to move on to bigger digs, he had five operatories and two hygienists. Now he has seven chairs with room for even more at his new digs in Amelia Crossing. Now comes the neat part. Mark left most of his equipment and furniture behind so the Barnabas Center can use it. I'm not talking about shabby and scratched furnishings that were one step from decorating the curb, either. The front counter was custom-made to his specifications, and remains in place as an integral part of the reception area. The furniture that he so carefully selected for his waiting room continues to complement this pleasant setting. He left behind all of the X-ray machines, as well as the ingenuous cabinetry he designed that allows one machine to service two operatories. The center's Samaritan and dental clinics both use these well-appointed spaces. It gets better: his landlord graciously allowed the Barnabas Center to assume Mark's lease. Better still, Barnabas has just received a $40,433 grant from the Blue Foundation to help with the expenses generated by these two clinics. "We couldn't have done this without Mark Olbina," Susan Holden-Dodge said when I talked to her about the dental clinic. Susan is the executive director of the Barnabas Center, and has known Mark for years; she is well aware of his many contributions to our neighbors throughout the county. "He opened the floodgates," she said as she talked about the clinic's early days. Now 14 dentists, augmented by hygienists and volunteers from Barnabas, from throughout the region provide much-needed care for Nassau County residents who have no insurance and cannot afford to pay for dental care. Susan said that she and the board of directors knew that the dental clinic was sorely needed, and the stats from its first year of operation have proven them right. Even though it was only open a few hours a week, it saw around 800 people during those first 12 months of operation. Our county's oral health is improving, thanks to all of the men and women who regularly contribute their private time and professional talent. 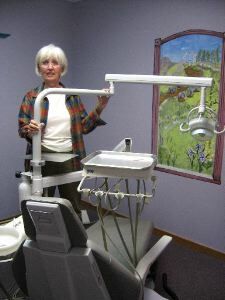 We all know how expensive dental care is, but most of us can only imagine how high the cost must be for all of the attendant equipment and supplies. The next time you have an extra dollar or two, write a check to the Barnabas Center. Tuck it in a short note that tells Susan you want your money spent on the dental clinic. 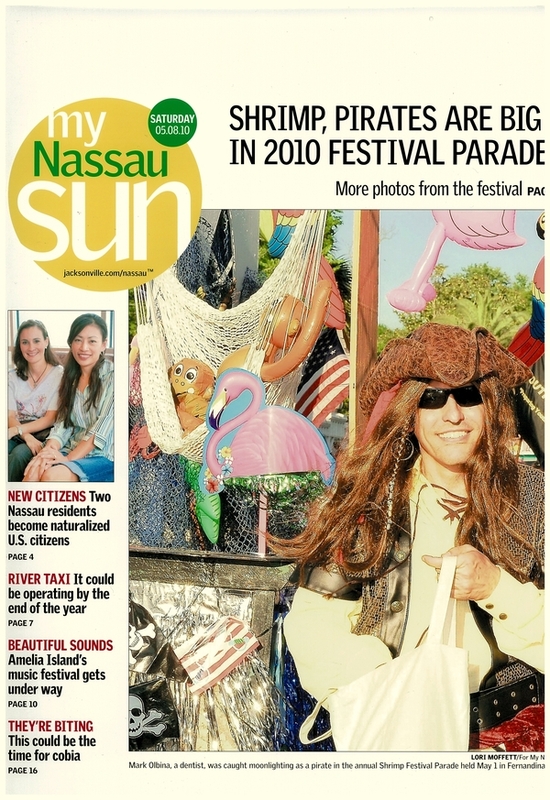 And don't forget to thank Mark and all of the other people who've helped to make Nassau County a better place to live. E-mail Cara Curtin at wordsmythe@net-magic.net. More than 200 exuberant dancers and observers attended the Dancing with the Stars fundraiser and competition sponsored by Classic Ballroom Dancing, Inc., at the Woman's Club on July 22. The event raised $10,000, to be applied to free lessons, dancing shoes, etc. for Amelia Island schoolchildren. "It was a great success," said Felix Solis, owner and instructor of the dance school. "Everyone seemed to have a wonderful time, and we plan to do this again next year." Solis, along with his wife, Chandra, and daughter, Jenee, organized the event and participated as partners to the contestants, local "stars" including doctors, dentists, civic officials, police and business owners. Those who attended voted for their favorites, and could vote as many times as they wished, at $1 per vote. There was also a panel of judges, and a combination of panel votes and those of attendees chose the winner. The winner and hands-down favorite, local dentist Dr. Mark Olbina, stole the show with a cha-cha. Jenee was his dance partner. The event sparked a great interest in classical ballroom dancing, even among attendees who had never danced before. Solis is adept in overcoming shyness and stage fright in those who would really like to try it but harbor fears of looking foolish. His "can-do" approach and easy, fun-loving manner overcome initial hesitation quickly. This is even more important in working with children - especially adolescents, who are so self-conscious about the image they present. Now, beginning this month, children who would like to learn will have the opportunity, and, because of the Dancing with the Stars fundraiser, will not be held back because of cost. Solis' own daughter, Jenee, has been dancing since she was six and began competing at eight, and Solis knows first-hand what a joy it can be in the life of a child. Solis feels strongly that our children need more positive ways to use their energy, develop life-enhancing skills and have a safe and productive outlet of self-expression, and he hopes to be able to expand his ideas into such avenues as a weekend teen club where students could socialize and enjoy different types of dance. Solis also offers private and group lessons for a fee at the Peck Center on Tuesdays and Thursdays. For further information, call the Peck Center at 277-1225, or leave a message for Solis at (904) 707-6762. FERNANDINA BEACH - The evening left dancers breathless and wanting more. Amelia Island's version of Dancing With the Stars drew more than 100 people to the Fernandina Beach Woman's Club July 22 and raised $8,000 for free ballroom dancing lessons for island schoolchildren. The effort was a family affair: Organizers Felix and Chandra Solis and his daughter, Jenee. Felix and Jenee Solis are professional dance instructors, teaching adults and children at Classic Ballroom Dancing and Kindermusik. The competition paired the dance instructors with celebrity volunteers from the community - some of whom had never danced before. Others had. Rae Lane dances the Rhuma with Felix Solis. Dentist Mark Olbina won the competition handily by surprising the crowd with the cha-cha. Partnered with Jenee Solis, he drew a standing ovation from the crowd. The couple scored the highest from the judges and more than 2,600 points in attendee voting. "I decided to give my wife and I the anniversary present of a Latin dance class about eight months ago," Olbina said after the competition. "We each had our hobbies that we enjoy, but this was a hobby we could develop together. We love it." Master of ceremonies Kristen Perrett called each contestant up for comments after their competition but she prefaced Olbina's by saying she didn't know her dentist could move that well. Nassau County Supervisor of Elections Vicki Cannon foxtrotted with Felix Solis. She wore a gown and jewelry provided by Chandra Solis. "I didn't dance at all before this," Cannon said. "But it was really fun. I think my husband and I will take some lessons." Others competing were Vicki Baker, assistant to the general manager of the Ritz-Carlton, Amelia Island, dancing the merengue with Felix Solis; physician Gerald Burford swing dancing with Chandra Solis; Bank of America official Gail Lay waltzed with Felix Solis; Club 14 owner Rae Lane did the rhumba with Felix Solis; Fernandina Beach Community Police officer Marty Scott did the salsa with Chandra Solis and Amelia Island Plantation real estate marketing manager Amy Hille mamboed with Felix Solis. Gail Lay dances the Waltz with Felix Solis. After his experience Scott said he thought it would be a great idea to work on setting up a teen night club on weekends where youth could learn to dance, perhaps throwing a little hip-hop in with the more classic fare. Solis said he'd be interested in pursuing fun and constructive things for youth in the community to do and knows a hip-hop dance instructor in Jacksonville who may be willing to come and teach it to youth. 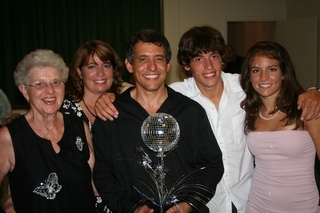 The money raised by Dancing With the Stars fund after-school ballroom dance lessons by Felix Solis this fall at Emma Love Hardee Elementary and Fernandina Beach Middle and High schools. The Solises also teach dance lessons at the Peck Center on Tuesday and Thursday evenings for a fee. "I really enjoy working with kids," Felix Solis said. "I would like to do more. If we can just keep the kids out of trouble." FERNANDINA BEACH - The Barnabas Center has received a $171,000 grant from the Ponte Vedra-based Sontag Foundation to begin a fee-based dental clinic for the economically disadvantaged. Executive Director Susan Holden-Dodge said she is thrilled with the opportunity to expand the range of services the organization offers. Barnabas now provides free medical treatment on Tuesday nights to the working poor and those without medical insurance in its Samaritan Clinic at the center on 11th Street. Soon it will provide low-cost dental services in its own clinic as well. Both eventually will be located in Barnabas Center's new clinic facility in the former offices of dentist Mark Olbina at 1886 S. 14th St. Olbina moved his practice to a larger office. "This has worked out perfectly," Holden-Dodge said. The two clinics will share the space, with the dental clinic operating during the day, and the Samaritan Clinic open at night. Expected to be open by May 1, the dental clinic will operate two days a week for the first six months. Days and hours for the dental clinic still need to be worked out, Holden-Dodge said. The Samaritan Clinic will continue 5 to 8 p.m. Tuesdays at the Barnabas Center until it moves to the new facility. "We had to gear up really fast with the Samaritan Clinic and we learned a lot of lessons from that," she said. "Dr. Olbina left the office with the electrical, plumbing, two X-ray machines and dentist chairs, and cabinetry, which is wonderful. It's a very exciting time." Barnabas already helps clients get dental care by providing vouchers to see dentists once a month at the Nassau County Health Department's Yulee Dental Office and through discounted fees at participating dentists. But the waiting list got very long, and Holden-Dodge said she began to see the need for a clinic to do the simpler things like extractions and fillings. The Barnabas Center still will outsource some dental services. The Sontag Foundation grant will cover the rent at the new clinic. To assure the foundation its investment will be sustained, a fee will be charged for dental services, but it will be a fraction of the typical cost, Holden-Dodge said. "This won't be a free clinic," she said. "But a filling will cost an eighth of what a dentist would charge. People will be expected to pay those greatly reduced fees if they need the service. That's how we will have to sustain our operations." Private foundations generally provide seed money to get a project started and to keep it operating for about three years. By then, the nonprofit organizations are expected to have other sources of funding, including fees. "It's an excellent program. All general dentists do some pro bono work but none of us can do a lot of it," Olbina said. "There is a big need out there. It gives people with acute problems a place to go. If I get a tax break for it, fine. If not, it feels good to help out the community." Holden-Dodge said Olbina's former office has five rooms; the University of Florida will look at it for a training site for students who end up with a seven-year doctor of medical dentistry after completing a pre-med biology degree. She said other volunteers will include retired dentists on Amelia Island. "The community has been very generous," she said. Susan Holden-Dodge points with pride to dental equipment donated by dentist Mark Olbina in what will become Barnabas Center's new dental clinic. It will also house the center's Samaritan Clinic, which provides free medical care to the working poor and uninsured. The Amelia National men's monthly round robin tournament wrapped up its first season. Each monthly winner won the right to possess the "wandering" trophy and have their name added to one of 12 slots on the trophy. Over the past twelve months, winners included Mark Olbina DDS, Carlos Chavez-Taifur, Ed Clifford, David Weihe, and Paul McTague. The overall winner for the year was Mark Olbina DDS, who now owns the "wandering" trophy. Vishnu Maharaj, left, presents the trophy to Olbina. Also pictured are Chavez-Taifur, McTague, and Clifford. On May 18, 2012 local dentist Mark Olbina participated in the annual Boy Scouts of America fundraiser, Over-The-Edge, in Jacksonville Florida. Participants are required to raise a minimum $1000 donation in order to participate. The donations can be the result of fundraising or as a corporate sponsorship. Those who qualified were invited to rappel from the top of the 450ft., 30 story AT&T building in Jacksonville. Dr. Olbina (an Eagle Scout since 1974) was the last to make the rappel during the three day event. The World Team Tennis season concluded Friday with a final four playoff at Central park. The Barracudas edged out the Outlaws in a final set tiebreaker. The Barracudas include (front row from the left) Jerry Gardner and team captain, Dennis Harbin: Back row, Mark Olbina DDS, Ric Borum, Darleen Morris, Cyndee Robertson, , Cathy Harbin, Susie DeMille, and Cricket Poston.